September 04, 2018, 2:16 p.m.
New research released by YouGov shows that organisations in the UK are discovering multiple benefits from the trend of focusing on reputation. Increased transparency, thinking more about wider issues and being more in touch with external stakeholders top the list of benefits but many firms are noting internal changes which could be considered to be less positive including more control from the top and becoming increasingly process driven. In July this year YouGov interviewed 254 senior individuals who work for organisations with over 10 employees, all drawn from its panel of UK Opinion Formers, asking them about the impact of reputation on their organisations with respondents split between those working in commercial, public and third sector bodies. Over half of those surveyed (55%) say that the focus their organisation puts on its reputation and how it is perceived from the outside has increased in the last few years while 38% say it hasn’t changed and just 4% say it has decreased. This increased focus on reputation rises to 61% amongst those working in larger firms with over 1,000 employees. 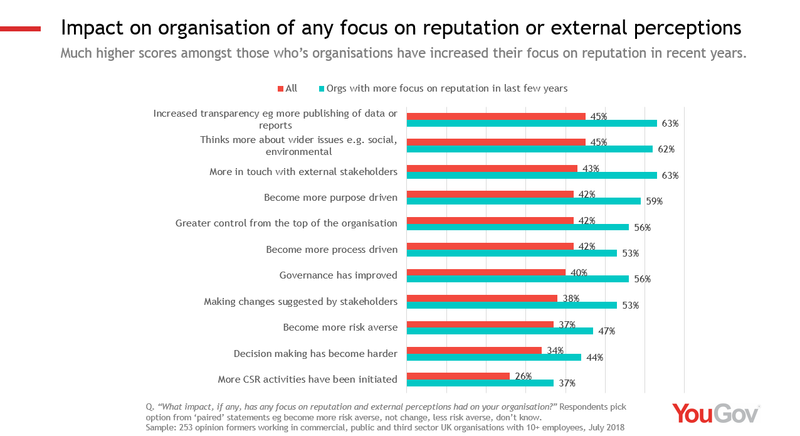 This increased focus on reputation has impacted organisations positively with almost half (45%) of all respondents believing it has led to increased transparency or thinking more about wider issues such as social and environmental concerns. 43% feel they are now more in touch with external stakeholders with 38% saying they are actually making changes suggested by those stakeholders. 42% say their organisation has become more purpose driven, with 40% also saying their governance has improved. Reputation is also leading to a quarter (26%) saying that more CSR activities have been initiated as a direct result. However the impact of dealing with this focus on reputation is that over a third (37%) say that their organisation has become more risk averse and a similar number (34%) say that decision making has become harder. Decision making is also thought by many (42%) to have become more process driven with the same proportion (42%) saying that their organisation is experiencing greater control from the top. When looking just at the 55% of respondents who say their organisation has increased its focus on reputation in recent years, all of these scores increase. Greater transparency jumps to 63%, as does being more in touch with external stakeholders, whilst thinking more about wider issues rises to 62%. Becoming more risk averse increases to 47% and 44% say decision making has become harder. The impact of dealing with the growing importance of reputation is that many organisations have become more transparent, are thinking more about wider issues and are more in touch with their stakeholders, with better governance and more purpose. However many have also become more top down and increasingly process driven while a smaller number have seemingly turned more insular, controlling, and opaque. 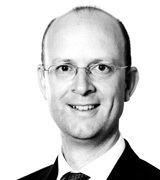 The challenge for all organisations is to work out how they can harness the benefits of a reputation focus with what seems to be inherent internal difficulties caused by the process of reputation management.